Just before the beginning of the First World War, the Russian artist Zinaida Serebryakova is forced to return to her homeland after the Italian journey. Arriving at the family estate, hidden in Kharkov province, she immediately begins to work on the images of the workers peasants. The writing of numerous etudes and paintings begins. During this period, she wrote a huge canvas, which she herself later destroys, leaving several small fragments from it. Based on the initial sketches and sketches, the artist planned to portray in her composition the images of peasants engaged in their usual daily work. It was mainly occupied by the image of the fields and the harvest. However, later the artist completely revises the plot of the picture and decides to depict several peasant women, vacationers or diners during the harvest on the field. 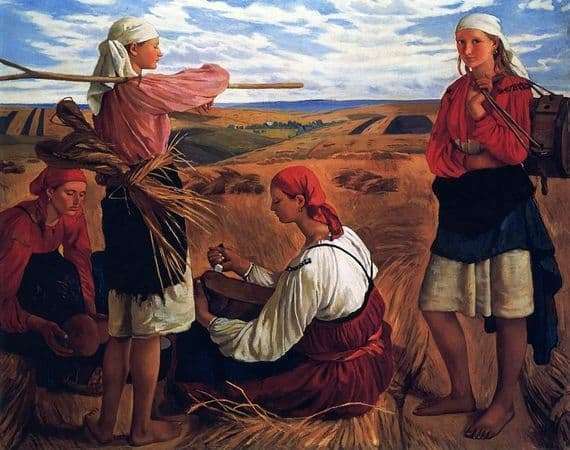 In particular, Serebryakova makes such a decision because of the mass absence of men in the fields, due to the approaching war. In the composition created, the artist decided to draw four young women, two of whom will be depicted standing, and two sitting on a haystack. For the landscape, the author chooses golden spikelets and yellow-green unplowed fields, as well as blue calm sky. The horizon line Zinaida Serebryakova places unnaturally high. In the distance among the fields, the domes of the local church, as well as the houses near the village of the native village, hide behind the branches of the trees. The artist initially called her picture “Peasant Women in the Field”. The girls are depicted in traditional peasant clothes with headscarves tied on their heads.